CONNECTED is a live stream weekly broadcast every Monday at 11AM PST from the Roland Studios in Burbank. This program is presented as a public service by RRFC (Recording Radio Film Connection & CASA Schools). Each episode of “Connected” presents ten job opportunities (or as we like to call them, “Grind Opps”) in film, music, radio and the culinary arts. These job opportunities are available not only to Recording Radio Film Connection & CASA Schools’ students and graduates, but to anyone who has the required skill sets for these jobs. There is no charge for applying. To sign up for the “Connected” hangout click here. Additionally, special guests (recent guests include DJ MAL-SKI and The Audibles) keep it real with insider tips on what it takes to make it in the business. Connected is all about providing opportunities to today’s youth. 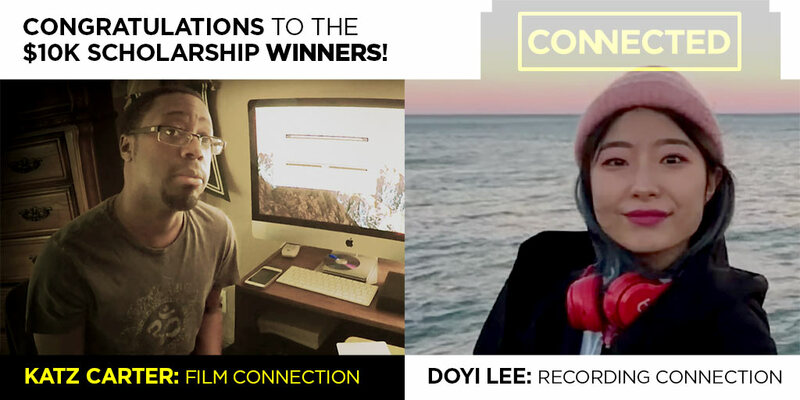 Recently, two loyal Connected viewers were awarded full scholarships to the Film Connection and the Recording Connection. Thousands tune in each week to get the inside scoop, industry tips and leads on full time careers in film, audio, and radio. DJ IZ is the host for “Connected.” He has been awarded 5 Grammy’s in music as well as numerous nominations as a songwriter and producer while selling over 40 million records. DJ IZ has worked with Macy Gray, 4th Avenue Jones, Jimmy “Jam” Harris, Terry Lewis, Mya, Janet Jackson, Mary J. Blige, Missy Elliot, Gwen Stefani, Mariah Carey, Chaka Kahn and more. From the rural suburbs of Maryland to the streets of New York City and beaches of Los Angeles, Cloie Wyatt Taylor is a country girl with a city soul. Getting her start in the dance world at the age of three, Cloie transitioned into television as a teenager- landing her first acting role on the hit soap, All My Children. After training with the Atlantic Theater Company and Collaborative Arts Project (CAP21) at New York University’s Tisch School of the Arts, Cloie traveled to the Caribbean to work with some of the finest dance masters of Cuba- a journey that has inspired and influenced much of her creative spirit. Relocating to Los Angeles in 2008, Cloie joined the post-graduate conservatory of Atlantic Theater Company where she has had the great fortune of working with famed Atlantic alums, David Mamet, William H. Macy, Clark Gregg, and Felicity Huffman. Since that time, Cloie has appeared across stage and screen, some highlights including- How To Get Away with Murder, the role of “Maria” in Coeurage Theatre’s production of Twelfth Night, and the new NBC hit, Superstore. For more information on Cloie, follow her @alwayscloie on Twitter, Instagram, and Snapchat. To learn more about the Recording Connection, click here. To learn more about the Radio Connection, click here. To learn more about the Film Connection, click here. To learn more about the Chef Apprentice School of the Arts, click here.